» Reviewed by William F. Deeck: PHILIP MacDONALD – The Crime Conductor. Reviewed by William F. Deeck: PHILIP MacDONALD – The Crime Conductor. 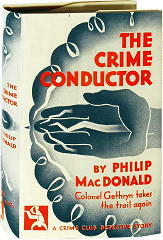 PHILIP MacDONALD – The Crime Conductor. Doubleday Crime Club, US, hardcover, 1931. British edition: Collins Crime Club, hc, 1932. One of the scarccr MacDonalds is The Crime Conductor, if the time it took me to find a copy is any indication. It is also, I feel, the least of all those of his that I have read. The “Crime Conductor” here is not one who directs crime but to whom crime is attracted — to wit, Anthony Gethryn. Gethryn is joking with his wife’s cousin, a surgeon, about crime occurring around him, and then the surgeon is asked by the police to examine a man who had drowned in his bathtub. Despite the locked bathroom door, the surgeon is suspicious of the death and, naturally, asks Gethryn to take a look. With some fancy deduction, Gethryn concludes it was murder and explains the locked room in the first third of the book. What he doesn’t explain is why a rich man, not known as a miser, would have lavish private bathing facilities but neither soap nor towels available. The rest of the book is not the typical MacDonald fair play. Read this one for Gethryn’s letters to his wife, with their delightful self-depreciation. Editorial Comment: There are 27 copies offered for sale on Abebooks at the present time, with a reading copy available for only thirteen dollars and change. Even so, I’d have to agree that Bill was correct in terms of its relatively scarcity. There are 179 copies of Warrant for X, for example, just as a quickie comparison. The only softcover edition of The Crime Collector was of British origin; it never appeared in the US in paperback form. This was pretty hard to find in the eighties when Mysterious Bookshop found my copy for me. It was also a bit of a disappointment though it certainly had its rewards. I’ve always felt MacDonald was at his best when he was able to mix a touch of thriller element into the classical detective mix, and Gethryn at his weakest when doing the classic great tec thing without the thriller elements. Though I agree about the letters and the self depreciation. I recall at the time wishing there had been more of that level of work in the rest of the novel. For pure ratiocinative analysis I did enjoy the author’s Persons Unknown/The Maze, however. It’s rigorously limited to a trail format and was quite interesting, I thought. At one time, although I’d hate to have say exactly when, if pressed, I think that Philip MacDonald, Ross Macdonald and John D. MacDonald were equally well known to the mystery world, in not quite overlapping fields, if not necessarily to the general public. While the reputations of all three may have faded since their deaths, I think that Philip MacDonald would definitely come in third in terms of being remembered, even by mystery and detective fans. But of those who might recognize his name, what do you suppose he’d be remembered for the most? His Golden Age detective fiction? His books that were more thrillers than fair play detection? The movies that have been based on his work? The fact that he wrote the novelization of FORBIDDEN PLANET as W. J. Stuart? I would think Philip MacDonald is best remembered for THE LIST OF ADRIAN MESSENGER, THE MYSTERY OF THE DEAD POLICE, LOST PATROL, and THE NURSEMAID WHO DISAPPEARED and his screen work, though I know there are a good many fans of his classical tec work too. I agree he is now a distant third behind Ross Macdonald and John D., but about 1960 I would have thought the race pretty even with Philip maybe even a bit better known outside genre fans. All three have fallen off in recent years, but with a little luck the Leonardo de Capprio Travis McGee movie I read about may bring John D. and his boat bum hero back into the limelight. I don’t know what the status is, only that Leonardo was supposed to be playing McGee, though whether there is a film or not is always up in the air. I’m a little surprised there hasn’t been a Ross Macdonald revival, but quite a few of his critical champions are gone from the field as are many who wrote in the Macdonald style, so it will likely take a rediscovery to bring him back to the forefront. Still both John D. and Ross are in print from major publishers which is more than I can say for Philip. Both Ross Macdonald and JDM’s McGee books have been hurt by the fact there are so few films. HARPER may have been a hit and THE DROWNING POOL did all right, but the ARCHER TV series and BLUE CITY went nowhere, while the two McGee films are mostly better off forgotten (JDM had better luck with non McGee movies, but really only CAPE FEAR stands out). There Philip MacDonald has a clear advantage with so many good films based on his books and so many screenplays bearing his name. I recently read a lot of the Ross Macdonalds and found the early Chandlerite ones a lot more entertaining (particularly The Ivory Grin). The later ones, with all the family psychology, made me feel like I was reading the same book over and over. Chandler’s writing is easy to lampoon, but I think his books will always remain popular because they have such an enjoyable sense of literary style. The Ross Macdonald books were, for me, greyer and duller, in their own way as much a product of their time as the Chandler (the letter reflect the age of psychoanalysis). I don’t believe Philip Macdonald has too much in common with Ross, besides the fact that they shared a surname. Though Philip did aspire to being a “straight” novelist, like Ross, their books are very different. It’s too bad Macdonald is out of print, books like Murder Gone Mad and The Nursemaid Who Disappeared (not a great title) remain ripping yarns. I do agree that in most of Philip’s detective novels the thriller writer in him is trying to break out; so that one the whole his best books are the ones where thriller elements predominate. David’s suggested date of 1960 as to when all three Macd’s were equally well known strikes me as just about right. P was heading toward the end of his career (Adrian Messenger), while R was making good strides toward the peak of his (the first three Lew Archers had appeared). Both P and R were hardcover writers, with not much in common other than their names, as Curt points out. JD was still primarily a paperback writer, so his books weren’t coming out from the book clubs, but in 1960 they were selling in the millions, even before Travis McGee came along (1964). I think Curt makes a good point about Ross Macdonald though I think his best period is probably the middle period of THE GALTON CASE, BLACK MONEY, THE DOOMSTERS and a few others. For what ever reason Ross Macdonald seems to me more dated than Chandler. There is a timelessness to Chandler’s best even though they are very much of the era they were written in. And it is true that eventually Macdonald’s books all started to blend together as if he was just changing the names of the damaged family from book to book. Don’t get me wrong, even the flawed Macdonald’s are outstanding reads and his style always worth a visit, but if he has slipped a little as the equal of Hammett and Chandler I think it is a combination of fewer great movies of his work and a feeling that he reached a time when his work became predictable. And there is this — and even Macdonald’s champions don’t dispute it much; there isn’t much to Lew Archer. He’s a voice, but not a character, not in the way Philip Marlowe or Sam Spade or Nick Charles are characters. There’s something insubstantial about Lew Archer. His worst critics call him a cipher, and that is something you can’t say of Chandler or Hammett’s least characters. In a way Archer is an almost zen version of Marlowe, the private eye conceit stripped down to nothing but a voice. Oddly enough, I am about to review The Crime Conductor for the British magazine CADS. I found a copy (1936 paperback) last year and although I had always considered myself a PM fan, I had to admit I’d never heard of this one. I thought I had read most of his crime novels and had even written an appreciation of Anthony Gethryn for an anthology of “100 Great Detectives” and the introduction to a UK reprint of Adrian Messenger. He’s sadly forgotten in his native country and remained in print in the US far longer than here. But even as a dedicated (and I thought well-read) fan, I have to agree with William Deeck that new readers probably shouldn’t start here. Crime Conductor has its moments of sly comedy but also one awfully casual bit of anti-Semitism, something which Macdonald was guilty of early in his career (as were many writers in the 1920s)but I thought he’d grown out of by 1932. Macdonald always tried to tell his ‘puzzle’ stories in different ways, sometimes quite outrageously and I always enjoyed the telling more than the puzzle. As to the other two ‘MacDonalds’ – both were brilliant and, sadly, both forgotten on this side of the Atlantic. For me, though, John D. was and always will be The Boss.